1. A detached garage offers extra parking in addition to the attached garage of the home, ideal for a family with multiple cars and drivers. Or, it offers sheltered parking for a smaller home that may not have an attached garage. 2. Detached garage plans come in a wide range of sizes and styles offering plenty to choose from and ensuring you’ll find just the right one to match your home, satisfy your needs and fit your lot/available space. 3. A detached garage can be positioned at an angle to the house, beside the home or tucked in the backyard giving your lot and home dimension. 4. A detached garage is a more visually pleasing option for smaller homes. An attached garage may dominate the façade of a smaller home. 5. Detached garages offer safer storage options for items that you shouldn’t store in your home or in your attached garage such as pesticides, gasoline for the lawn mower and other hazardous chemicals and materials. 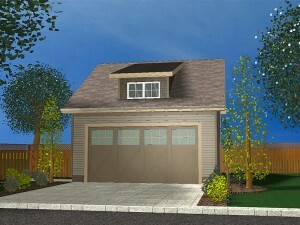 The detached garage offers storage space away from the home. 6. By situating a detached garage in the backyard, think of what you can do with the space beside the home where an attached garage would ordinarily be located. This space might works well as a vegetable or flower garden, a patio or a deck for your enjoyment. 7. If you are in need of extra storage space or finished living space, sometimes it is easier to add these areas with a detached garage. Consider a storage loft above for all of your basement or attic overflow, or a garage apartment design for guests or the in-laws. Some detached garage plans provide the perfect place on the second floor for a home office or game room that you may not have space for in your home. 8. Some home owners prefer a detached garage with a nicely landscaped walk connecting the garage to home. Nothing like starting the day with a quick walk from the house to the car with beautiful flowers and shrubs to view. If you are planning to add a garage to your home, take some time to consider the benefits of detached garage and browse this collection of garage plans. You’ll be pleased to discover the flexibility you will have with a detached garage. Thank you for sharing useful post. I’ve never considered a detached garage before. After I read your article I agreed with your reasons. Those are reasonable.